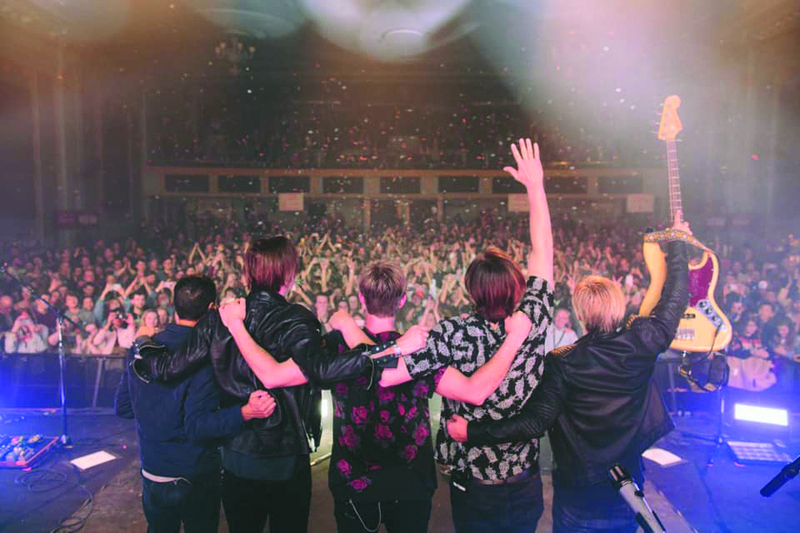 On the band’s newest album — and at its upcoming show at The Arlington Theatre on April 6 — San Diego’s Switchfoot speaks a musical language of love. Native Tongue, released in January of this year, sees the chart-topping, Grammy Award–winning alt-rock band rallying around a hopeful message in troubled times. I spoke with guitarist Drew Shirley about the new album, taking musical risks, and making sacrifices in love. Tell me about the title of the new album, Native Tongue. The title track is about our original language, and our original language is love. So much of the world you see today, the language is hate, division, greed, and fake news. Our original language is love, and we want to be a band that spread that message and sings anthems for hope and love. Native Tongue is a chant, a war cry to return to our native tongue of love. Are there ways in which the album’s themes resonated personally with you? Yeah, definitely. My wife went through a major medical trauma last year — she had a brain aneurysm, and it was very life or death. …When you have a medical condition that big … your life just stops. Nothing else really matters other than: How are we going to live from here on out, and what’s really most important? My wife and I really tore down a lot of the bad patterns that we had built up over the last 15 years of touring. I found that love sacrifices and gives to someone else and does the hard work to change things in yourself, things that are hurting in yourself and hurting the relationship. To face these skeletons, to face these deep-rooted issues that, literally, like a cancer, have been tearing this relationship apart. You never really wish for a trial, but when you go through a trial, you grow so much [that] it’s almost worth having them. How is the tour going so far? It is awesome. This is our first tour in over a year, so it’s very fresh, and we’re very excited — our batteries are charged. We took all last year off the road, which is something we haven’t done in 15 years. Doing that was the smartest thing we could’ve done. Touring is a fake world; it’s sort of not real life. You’re coming and going from home and your kids, you get free food and drinks everywhere, people are clapping for you every day. It’s a fake world, but we lived in it for so long that we needed to detox. We did that over the year with our relationships: with our wives, our kids, and our friends back at home, and we brought the balance back. I feel like I’m on my feet again; I’m balanced. I was feeling off-balanced as a man, after touring for so long. This new album has a lot of diverse styles on it and seems to go in uncharted territory. That’s right; we did take some musical risks. We wanted to push ourselves to come out with something that doesn’t sound like something we’ve done before. People are used to playlists these days, with songs from all over the map. ’60s, ’70s, ’80s, something from The Beatles, something from M83 … so we said, okay, we can put all the sounds of the playlist in one record ourselves, and give something to everyone. Worship music has been around for thousands of years, but Christian rock has been around for a few decades as a genre; what new things do you feel you bring to the genre or culture? Christianity is a faith and not a genre of music to us …. We sing songs from our heart, where we’re from, and our worldview, just like everybody does. If I had to look at what you’re calling Christian rock, it was fake for a while. We defied that category, and don’t want to be lumped in with a lot of Christian rock bands. We want to sing honest music, and I think that in that genre there was this Christian bubble that was not honest. … Things don’t always go well, life is hard. … So there was this fakeness to this Christian bubble, and that’s changing. People are now going, “If you’re going to be honest, I’ll listen to you and accept what you have to say because I’m human like you, so speak to me like a human, not from some uber-spiritual position where you’re pretending not to face real life.” We’re a band that wants to be paving the way out of that fakeness. Switchfoot plays Saturday, April 6, at 8 p.m., at The Arlington Theatre (1317 State St.) with openers Colony House and Tyson Motsenbocker. For tickets, see axs.com or call the Arlington Box Office at (805) 963-4408.